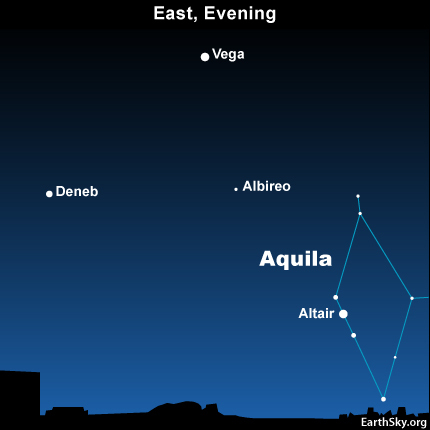 In the east after dark, near the horizon, Altair, the brightest star in the constellation Aquila, the Eagle, springs into view. This is the bottom star of the Summer Triangle. The Great Rift of the Summer Milky Way passes through the Summer Triangle, between the stars Vega and Altair. Thought the Great Rift and the Milky Way will be hard to see tonight because of the waxing gibbous moon. In dark skies in late July and the first two weeks of August, you can see rich star fields with your binoculars on both sides of the Great Rift. Altair is probably best known for being the home star system of the aliens in the 1956 science fiction film Forbidden Planet. The whole Summer Triangle area is great to observe with binoculars or in dark skies with just your eyes. If you like finding hidden pictures, get set to find a Coathanger, the North American Nebula (NGC7000): and Ring Nebula (M57). Site contents copyright © 2019 Recorder Online	except as noted. All rights reserved. | 88 queries in 2.094 seconds.